DiveMeets is the most advanced and comprehensive Diving Meet Management System in the world. 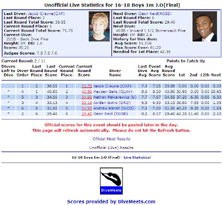 DiveMeets, via its website and Meet Control software provides a start to finish system for running a Diving Meet. The Meet Control software is used to run the meet. We post the results to our online database so that divers, coaches, and parents can view their competition history at any time. Meet Results Page (Click above: Meets, Past Results & Photos, etc. Diver Profiles (Click above: Find, Diver, and enter the last name of the diver you are interested in.